One of my recent projects has been the construction and painting of a Techmarine with a Thunderfire cannon. I had no idea what I was getting into when I started this project. It's definitely not a basic "beginner" model. That's for sure. There's something like 2,000 pieces to this guy and his silly cannon. I did manage to get him assembled though. A little bit of greenstuff to fill some gaps made all the difference in the end. Of course I added some additional sculpting to the model. Since he's a Raven Guard Marine, I sculpted the chapter symbol on his shoulderpad, his knee and the side armour of the cannon for good measure. 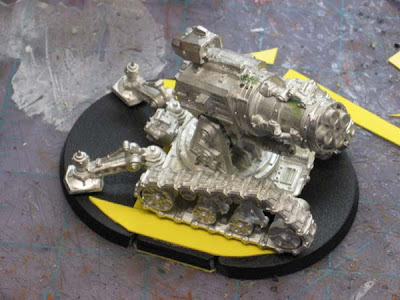 The real beauty of this model is the base for the cannon. After I had the thing assembled, I took one look at it and thought to myself it needed to be based. It weighs a ton and has lots of little fragile pieces that stick out... so naturally it doesn't come with a base. And to top it off, any regular base I could find didn't work. A custom base was required. Not part of the original commission, but I can't just hand my Client a model and say "Good luck, I hope it doesn't break. You know, that thing could really use a base." 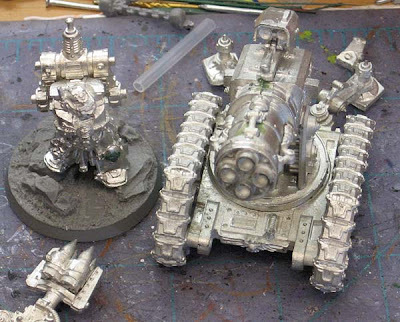 Since the Marine sits on a resin base from Dark Arts Miniatures and I was stuck building a base for the gun from scratch, it would have to match the resin one. As I mentioned, I tried to see if the gun would fit on a standard dreadnought base, but no luck, it hung too far off the front and back. 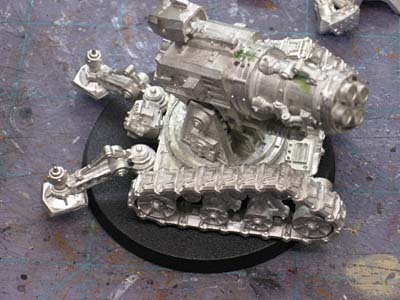 The base needed to be just big enough to protect the gun support feet that attach to the back of the cannon body. I found a resin base that would have worked, but it was too large, coming in at 60mm wide by 100mm long. I need 60mm wide by 80mm long. I know, 20mm seems like no big deal, but I wanted to get it right and have the model fit nice and snug on the base. I ended up picking up a bag of GW bases from my FLGS (Game Vault) and taking the dreadnought base from there and extending the middle a bit. All I did was cut the dreadnought base in half and fit a short (straight edge) base piece in on each side. A bit of plasticard here and there along with some greenstuff to fill the gaps and I was in business. My Client asked that I add a few extra elements like a low wall in front of the gun too. No problem, I was trying to mimic the resin features, so it was no big deal to put that feature in there. Makes it look "urbany." 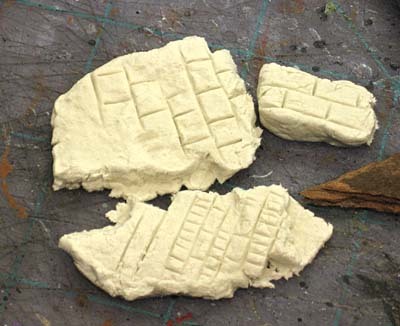 The stuff I used to build the walls is called Creative Paper Clay. It's an air drying clay that is hard as a rock when dry and light as a feather. I've used it before on my Lustwing army to create their bases. The gun is pinned to the base in four places. Under each foot and once under each track. The actual barrel will just rest on there. That way it can be taken apart for transporting. The other thing I'm doing with this guy is painting him in sub-assemblies. If you've built one of these, you know how impossible it would be to try and paint the Marine with all his mechanical arms glued in place. How did you do the base and was the barrel distorted? As I was given one for my Iron Warriors. It looks fantastic Ron! Can't wait to see the techmarine all painted up. Great stuff. I've just put one together myself, and while the actual assembly was fairly straight forward the addition of adding a base will really make a difference, and I'll be adding one to mine shortly. Derina: How did I build the base itself or how did I go about getting it to look like it's resin counterpart? The barrel wasn't so much distorted as the two halves just didn't line up perfectly and the seam (while hidden by other elements) was still quite visible in some places. Roll With It: I didn't know this thing had a reputation before I started, but I see why now. It's not that bad, just a bit more work than most models out there that I've come across. Ron: I totally agree with your sentiments, I had to do one of these for a client and after looking at the casting of it I cringed in horror. The casting of the one you have done here looks a lot better though. In the end I dremelled some of the centre out (where the halves join) and made them go together. Once assembled it was straight forward to paint and ended up looking really smick. 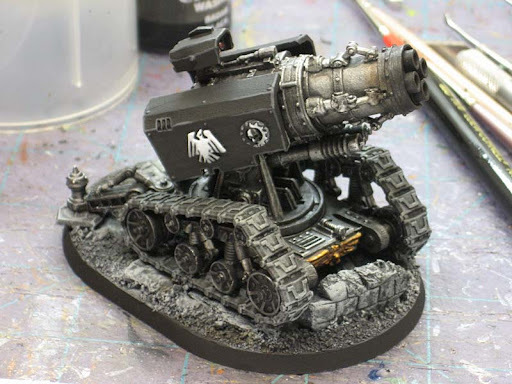 I still have my own to assemble and looking at one on a base like that (and how good it looks) makes me want to do one for mine. I like these and have been playing with the idea of getting two. I really like the touch of putting the Raven on it. Da_Sub: Agreed, construction was bad, painting was fairly straight forward. Derina: I will put together another post that outlines exactly how it was built. That would be easier than trying to explain it here.